Having a dependable, high-quality garage door at your home or business helps ensure safe operation and can improve the appearance of your building. At Action Garage Door Repair Specialists, we offer a wide selection of residential and commercial garage doors for homes and businesses in Texas, including Dallas, Fort Worth, San Antonio, Houston, and Austin. Our selection of garage doors is from well-established brands that produce superior quality products. Our team of specialists can help you choose the most suitable garage door for your home or business and install it properly. Whether you are looking for a new garage door for your residential or commercial location, the aim is always to get the best product at the best value. Replacing the garage door on your home is the #2 most valuable return on investment for a home improvement. A new garage door can bring a 75.2% return on your investment. Let Action Garage Door help you find the best garage door to fit all your needs. Our garage door technicians can explain the terminology needed when you compare different garage door models and materials. Ultimately, helping you meet your needs, whether you need to find your new garage door manual or find a brand new system. When comparing steel gauge, the lower the gauge number, the thicker and stronger the steel. For safety, we recommend using a new track whenever you have a new garage door installed. The old track may not be compatible. Garage doors must be properly aligned and balanced for proper performance. Garage door manufacturers use R-values to indicate the overall energy efficiency of their products. That number is calculated from a formula that takes into account the thickness and chemical makeup of the garage door insulation. Polyurethane insulation is generally considered a better insulator than polystyrene. The R-value refers to each individual garage door section, so the quality of the garage door’s construction greatly impacts energy efficiency. Garage doors generally come in a few different types, including those that roll up, those that slide to one side, those that swing out and those that swing up. Roll up doors that feature different sections are among the most common type due to the convenience and smoothness of operation they offer. You can also get garage doors made from different types of materials, including steel, wood, and aluminum. The garage door that will work best for you will depend on certain factors, such as the style of your home and the amount of space you need in your garage. We also offer custom garage doors that provide you with a wider selection of styles and designs to choose from. Our experts will go over the brands we carry in order to help you find the ideal garage door for your home. With our help, you’ll have a garage door that enhances the appearance of your home and performs reliably and safely, so that you can get into and out of your garage with ease. Action Garage Door offers a wide selection of residential steel garage doors to customers in the Dallas, Austin, San Antonio, and Houston areas. The Amarr brand of residential steel garage doors features three pinch-resistant models: Stratford (good), Heritage (better), and WeatherGuardTM (best). We also carry the Olympus, a tongue and groove garage door model that provides superb energy efficiency. All Amarr steel garage doors are made of roll-formed American-made steel that has been hot-dip galvanized to resist rust. These highly recommended garage doors are pre-painted with a primer and tough polyester top-coat, providing years of low maintenance beauty. Whether you are shopping for a premium steel garage door or standard steel garage door, Action Garage Door has the perfect product for you! We can even dispose of your old garage door as part of our service! The Classica garage door is the first steel garage door in the world to have a carriage house look. This brand is rendered in 100% pre-painted steel with a pinch-resistant design. The door works like a typical sectional garage door, but its 3-section design gives it a vertical swing-out look. The Classica, available in 32 design combinations, is the most affordable all-steel carriage house door on the market. Action Garage Door offers a beautiful line of residential steel garage doors inspired by actual doors and other architectural elements seen in the renowned Biltmore Estate of North Carolina. Our Biltmore Estate For Your Home® Carriage House garage door combines the strength of steel with the look of wood. 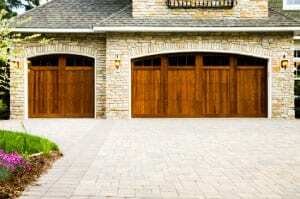 Action Garage Door offers a variety of wood garage doors. Made of 1-3/8-inch-thick kiln-dried lumber, these wood garage doors can be unfinished or primed. These garage doors come with a wide variety of glass and window trim options. A wide variety of widths and heights will accommodate most garage door openings. Choosing the right garage door for your home is just the first step. After you’ve found the perfect door, it will need to be installed properly to ensure that it works safely. Our experts at Action Garage Door Repair Specialists will handle every step of the garage door installation process when your new door is ready. Our team has years of experience installing garage doors for homeowners in the greater DFW area. Whether you choose a traditional garage door or a custom one with special features, our professional installers will make sure that it’s installed correctly. Our garage door repair specialists are ready to earn your business! In Dallas-Fort Worth and surrounding cities, call 972-254-4040 or 817-633-3119. In Austin area cities, call 512-447-3667.